Sefton Council has launched a new crowdfunding initiative to help community groups and volunteers create incredible projects to transform the borough. The local authority has teamed up with national crowdfunding platform Spacehive to create the #SeftonCrowd, a community-led initiative which can help groups and individuals to improve the communities where they live. Supporting a project can cost as little at £2 and funding may also be available via Sefton Council’s Community Transition Fund. Cllr Trish Hardy, Sefton Council’s Cabinet Member for Communities and Housing, said: “The creation of #SeftonCrowd is a fantastic legacy to our Year of the Volunteer project and supports our 2019 Year Of Friendship in a huge way. “We want this initiative to encourage, support and create community projects which make a huge difference to our brilliant borough. “All creative ideas and proposals are welcome and we encourage as many groups and individuals as possible to consider a crowdfunding campaign through the #SeftonCrowd. Chris Gourlay, Spacehive CEO, added: “The Spacehive team are excited to launch the Sefton Crowd alongside the council and its partners. 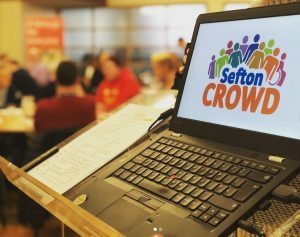 Community groups and volunteers who are interested in creating a #SeftonCrowd project can attend a special workshop at Crosby Lakeside Activity Centre on Wednesday, February 13 to learn more about putting together a proposal.